Smores the cat. My name is Mary and this is my cat. Her favourite food is: Smores loves Purina Cat Chow and any type Friskys can food. Of course she loves treats. Cat photos really tell a story don't they? Look at the expression on Smores face. Napping on my lap as I work on the computer. Her funny habits are:When you talk to Smores, she turns her head from side to side as if she is trying to understand what I am saying. She is very vocal and spoiled. She talks back when spoken to. Smores came to me through my rescue in 2007 when her current owners bought 2 new dogs and threw Smores (then 2 yrs old) and her mother (Snickers, then 10 years old) out into a very bitter winter to make it on their own. They was not use to being outdoor cats and they made their way to a neighbors house who heard them crying and shivering on her porch. She contacted my rescue and we took in Smores and her senior mother Snickers. They are with me still and I love them dearly. Smores came to me in the winter of 2007 when her owner threw her out in the snow after they bought a new dog. I could not think of a good name for her but after looking at her beautiful Tortie colors, all I could think about was a mixture of chocolate, caramel and marshmallow so I named her "SMORES". She had been with us only a couple says when she accidently slipped out the door and ran off into the cold Michigan winter night. I was in Virginia visiting family when she ran off and my poor daughter spent most of that night walking the cold streets hunting for her but to no avail. When I returned home my daughter had to break the news to me that Smores had run off and she had not been able to find her. I was devastated. I knew this poor cat had been tossed from a warm home because they chose a dog over her and now that I had taken her off the street to give her a good home, she was now lost and alone again. For 10 days we searched for her and I couldnt sleep at night thinking how hungry she must be and wondering where she was finding shelter to stay warm in a strange neighborhood. Then as I had given up hope of ever seeing her again, I got a call from my daughter at work on the 11th day. My daughter was crying and could barely breath as she was trying to tell me something but I could not understand her through her crying. I finally told her to calm down and tell me what was wrong. She blurted out " SMORES IS BACK "!!!!! She was crying tears of joy! She said she had been working on the computer when something caught her eye out the window, crossing the back yard. She got up to look closer and seen Smores approaching the back door. My daughter went to the back door and lured the very cold and very hungry Smores into her arms and hustled her back inside. 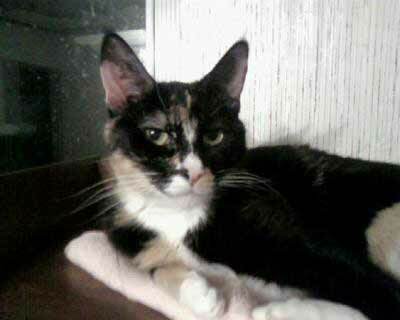 That was December of 2007 and to this very day Miss Smores has NOT stepped foot on the outside NOR will she ever. She has become quite the spoiled mama's girl who sleeps in my lap when Im working on the computer and by my side in bed at night. Smores and I are kindred spirits. We relate to each other and know what each other is thinking just by looking into each others eyes. No more cold nights for you my precious Smores girl. what a wonderful story about Smores the cat....i know how that feels to have one missing.